I love finding old forgotten treasures at the library. 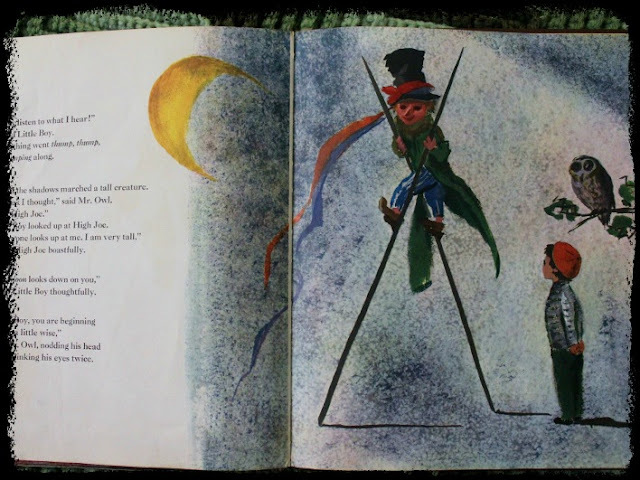 So many of the Golden Age picture books in our library system, though, are categorized as "Decorative Arts" or "In Storage" and are not available for check out. 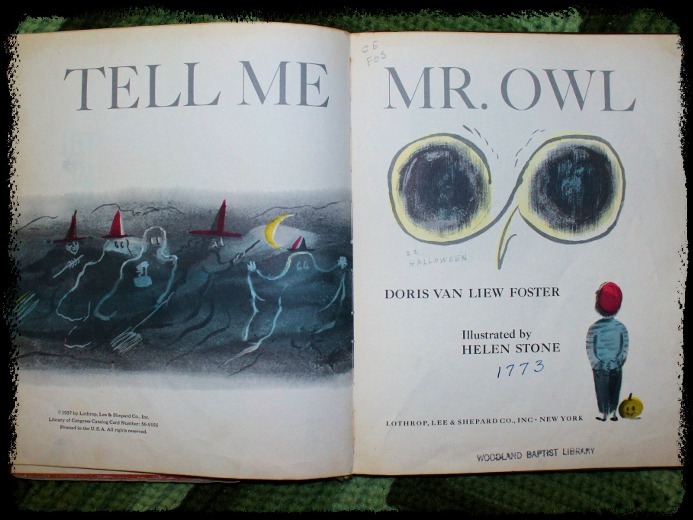 Tell Me, Mr. Owl by Doris Van Liew Foster, illustrated by Helen Stone. Lothrop, Lee & Shepard Co, Inc., 1957. 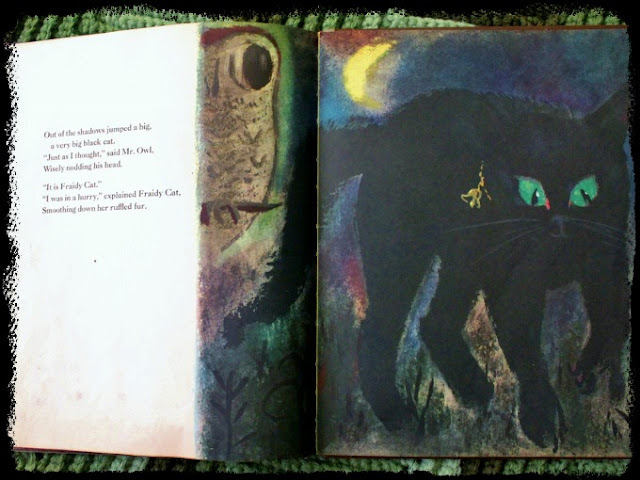 One I lucked out in finding was this odd Halloween title. 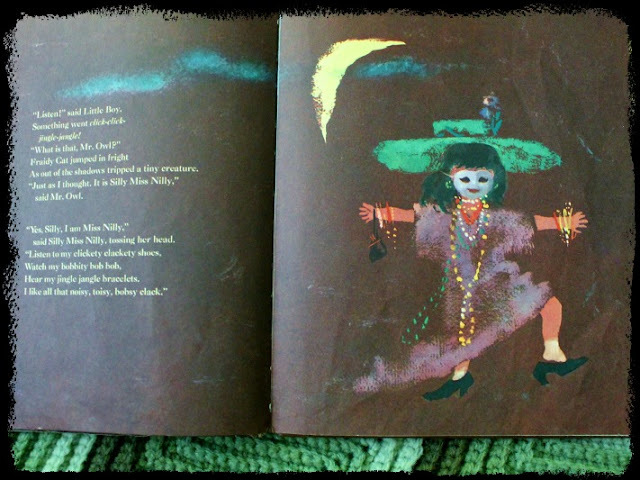 The smudgy illustrations held a certain odd appeal, and I loved the spooky, vintage-style Halloween costumes. The text is strange, full of weird references such as "Weenky Days" for trick-or-treaters. We found an old library copy used on Amazon. 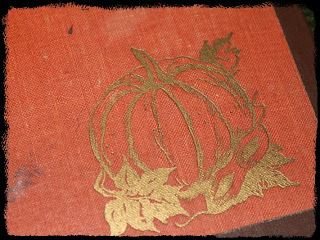 It was missing that wonderful dust jacket, but it needed a good home! 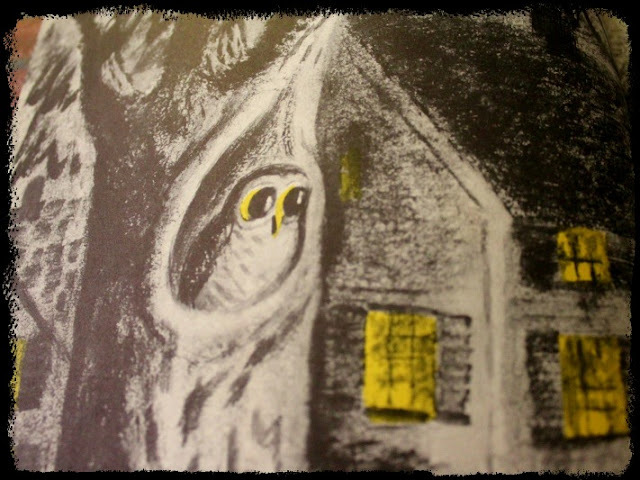 The boy of the story asks Mr. Owl about all the strange noises he hears that night. 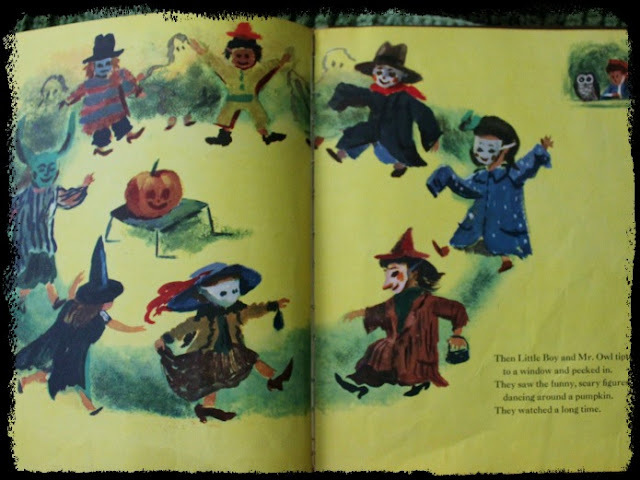 First, the noises are mundane sounds such as a black cat and a scarecrow, but soon they turn out to be costumed folk with names such as Silly Miss Nilly and High Joe. 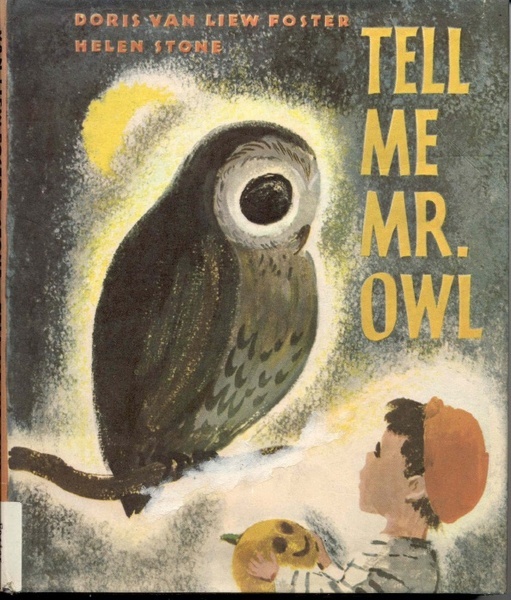 Finally the owl asks the boy about a large group of costumed kids. The boy replies they are Weenky Days, and describes trick-or-treating. They follow the parade to a house, where the Weenky Days go inside for a Halloween party. The owl and boy watch from a window. Then they bid each other farewell, and we see a picture of a nice peaceful town. One of the reasons I love to get a hold of vintage books is because I'm so intrigued by the life of the book previous to it coming to me. I love it when there's an old library card or a heartfelt inscription... just makes me excited! Cool find! Ohmygoodness, me too! I love old books with library cards in them, or to see sweet inscriptions inside. 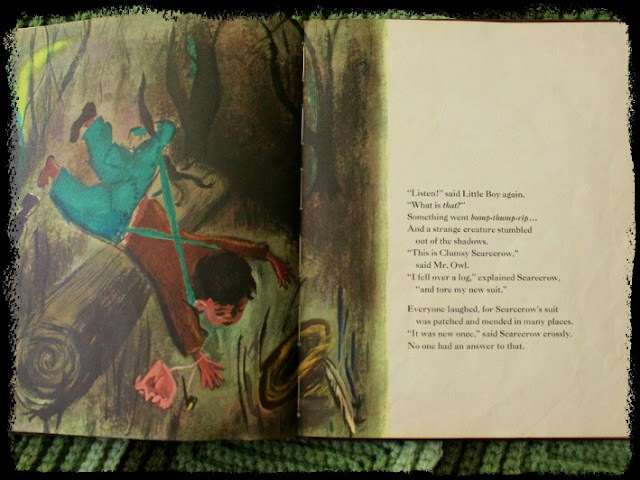 It's one of the reasons I love the Vintage Bookmarks blog. I love seeing all the stuff people leave inside their books, too. Very cool! 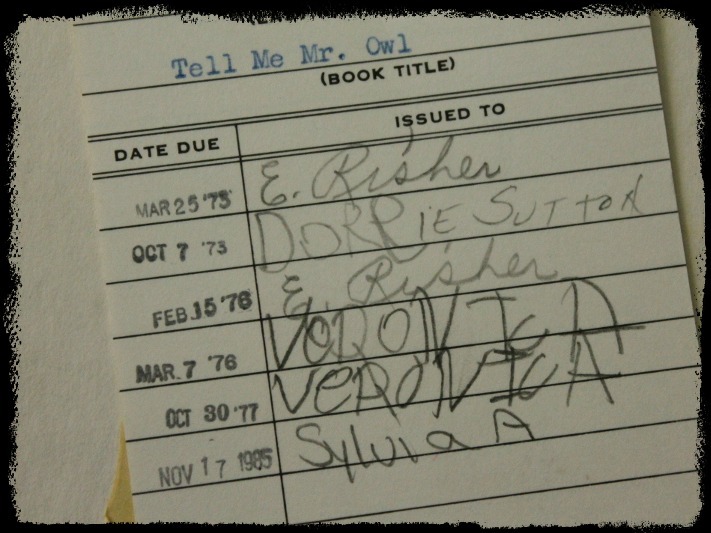 Glad that you rescued this poor book so that it won't be forgotten! Isn't it neat? 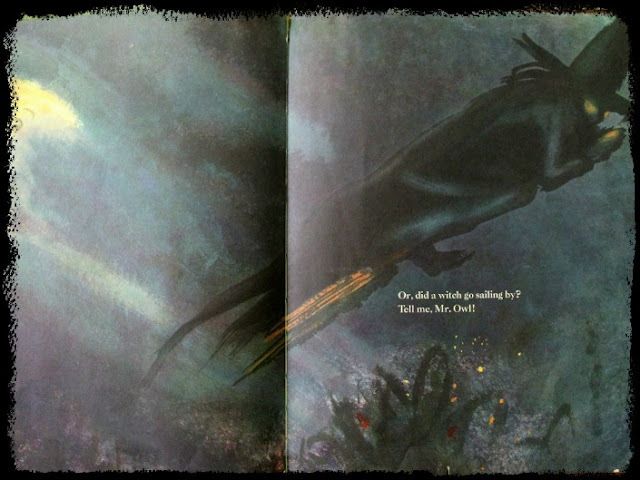 I love the art so much I found a few other books illustrated by Helen Stone at the library. They're smaller, and for slightly older readers. I'll show them off soon! OMG THE ART. THE ART!!!!!!!!!!!!! This is amazing Danzel, truly. What a find! Isn't it great? The pictures are so dark and smudgy. I love them! 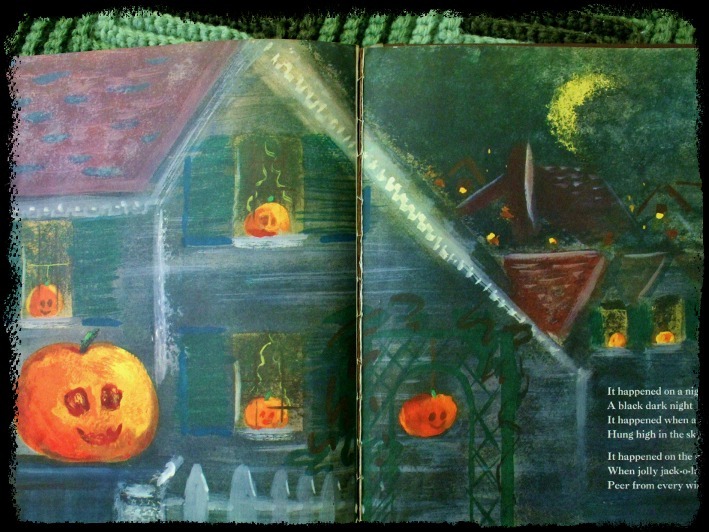 I love keeping seasonal books with my decorations, and this would be such a fun book to have on display for Halloween!